It took me a day but I've got a pretty detailed article up on the new Pentax K-01 compact system camera. Aside from the Fujifilm X-Pro1, the Pentax K-01 is probably the most interesting announcement so far this year. It's an interesting camera, with a fancy designer, a big APS-C sensor and the K-mount lens mount makes it totally backwards compatible with all Pentax lenses - no adapter required! Here's my article - including a very good hands-on video I dug up on YouTube! 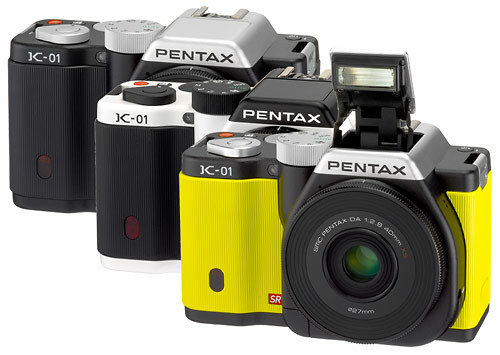 There's already a discussion about the K-01 on the Pentax forum. What do you guys think? That sure is an odd ball design now I see it in someone's hands. It reminds me of the Panasonic L1 which still has followers that love it. I don't like the rubber cover. It don't think it will stand up a long time before coming off. Built in time lapse is interesting.